First it was the Grand Casino that brought the wealthy to Monte Carlo, then it was the Monaco Grand Prix, and now it is the Tour de France. The tour peddles off from one of the smallest countries in Europe, covering only 195 hectares of land. Monaco today is an ultra-modern and extremely wealthy independent state and a playground for the rich and famous however, its Royal family is also one of the world’s oldest monarchy. Prince Albert’s father, Prince Rainier III was a descendent of a Grimaldi who entered Monaco fortress in 1297. Monaco owes its fame and fortune to its Grand Casino. In those private parlours there’s plenty of intrigue and many legends, and the high rollers and personalities who frequent the Casino all form part of the pageant of the Casino. It was back in 1878 that Charles III instituted the casino to save himself from bankruptcy. The casino was so successful that by 1870 Charles was able to abolish taxation for his people. 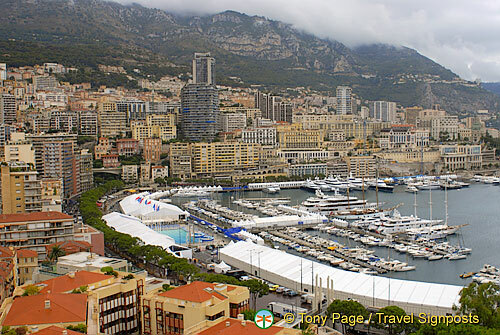 Monaco today is a tax haven for the mega-rich and its residents have the highest per capita income in the world. The Grand Casino still attracts a lot of visitors, tempting people to empty their pockets into the slot machines. However, I think it has lost some of the exclusivity and the elegance and glamour of the James Bond days. The last time we went in there for a look in the evening I was disappointed to see some visitors wearing jeans in the Casino. Certainly there wasn’t anyone in tuxedos resembling Daniel Craig or James Bond. A popular attraction on any Monaco holiday is a visit to the neo-Romanesque Cathedral of St. Nicholas. This is where the past princes of the Principality and their wives are buried and is also the burial place of the Grimaldi family. Princess Grace is still fondly remembered and each year on September 14th, the anniversary of her death, people come to lay garlands and baskets of flowers on her tomb. This little country has lots of interesting museums and during our short stay in town we had a choice of visiting the Palais Princier or the Museum of Napoleon Souvenirs. As the queue to the Palais was quite huge, we visited the Museum of Napoleon Souvenirs next to the Palais. If you’re interested in the history of Napoleon and his many military campaigns, you’ll be fascinated by the exhibits in this Museum. There is a lavish collection of over one thousand items and documents relating to the First Empire, with items belonging to Emperor Napoleon I, garments of the King of Rome, religious tokens from Saint Helena and the like. It was amazing seeing the famous hat worn by Napoleon at Marengo, his red leather desk blotter, the watch he wore during his campaign in Russia, his signature at the bottom of a letter, and more. Certainly more than one hour is required if you’re keen on seeing the memorabilia of the Emperor and the exhibition of military uniforms worn by French and Monagesque soldiers through the different periods. If you’re in the main square near midday, there is a changing of the guards ceremony each day at 11.55 a.m. It’s only a smallish ceremony, but nonetheless causes much excitement amongst the throngs of tourists looking to capture any magical moments for their holiday albums. Monaco by Night is all about seeking thrills and trying your luck at one of the many casinos, parties and dances at nightclubs or catching a cabaret. If like us you’re not into the casino scene, you could go to the Hotel de Paris, across from the Grand Casino and just have quiet drinks with friends. Note: Post temporarily held in France blog.